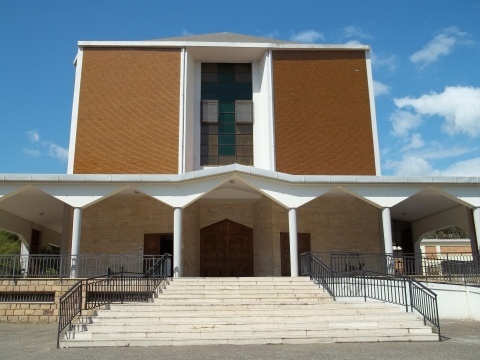 It is a church located in the suburbs of Cagliari; its has a modern structure and has large stairs in front of its entrance. The church and parish of St. Eusebius has an impressive modern structure, with fairly regular shapes which can be accessed by a wide staircase. The facade has a rectangular shape and is characterized by a large porch, where we find the front door and two side doors. The upper part presents a stained glass window with polychrome glasses arranged in the shape of a cross. The interior has a large rectangular form with a semicircular chancel, raised above the nave; here, there is a massive bronze altar surmounted by a crucifix. The side walls are covered in red bricks and adorned with sacred images.